The name at first glance may suggest someone has a big tummy ache! But at Aunty Acid Bingo the only ache will be the urgency to play again and again. Aunty herself beats to a different drummer and has all the sass and tongue and cheek humor players will appreciate. Your attention is certainly captured with the most outlandish name yet for an online Bingo site. Full of lighthearted fun Aunty will warm your hearts with good cheer. The pink haired looking little granny has all the sassy spirited humor that is refreshingly different. Making its virtual debut in 2013, it is where the UK Bingo community is turned upside down, standing on their heads with laughter with Aunty Acid’s daily wittycisms. 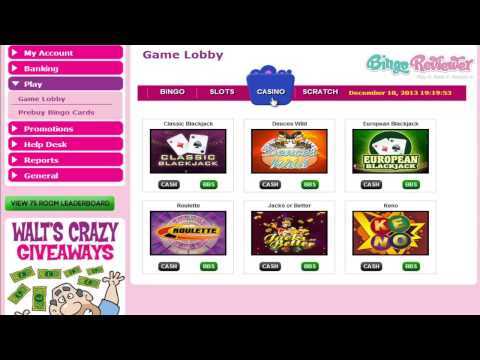 Cozy Games software launches the gaming platform as one of the most highly recognized Bingo supplier in the online industry. There are heaps of Bingo Bucks up for grabs that can be played as well as cash on games. The site is certified by C.O.M.D.O verifying the site as authentic and secure. Aunty Acid Bingo is abides by the laws implemented from Isle of Man where a license allows them to operate. It will be tough to find a better Bingo platform with 4 different variations of Bingo to choose from. The world is your oyster with UK’s 90 ball, US 75 ball, 80 ball and 30 ball speed Bingo variations. You won’t have to leave Aunty at home because the Mobile Bingo goes where ever you go, so you won’t shake loose of her too easy! A fine selection of Slots are on hand to spin until your heart’s content. Enjoy popular favorites like Honey Bees, Rubies & Sapphires, Queen of Legends and more. Take a stroll in the Casino and find card games like Blackjack or Video Poker. Take a spin of another kind on the Roulette wheel. Scratch Cards and Keno are also available. We have saved the best for last and it is certain to blow the ladies skirts up (gentlemen no peaking) with No Deposit Bonus required. Yep, play the games for Free without any obligation. There is more Freebies with Free Bingo rooms offering up prizes to winners. Afterwards admit, you are going to want to make a deposit right? Aunty has it all covered with a special Bonus gift on your first three deposits. The Promotion page has so many categories of specials and promos the hardest part will be deciding what to claim first. The site is high-spirited and feisty offering a unique playground of fun. We are impressed with the enormous line-up of promotional offers. We rate Aunty Acid Bingo with 4 Pink Hearts. This is one hell of a weird site name, and I just can't help but think that the one who was in charge of the name was on acid. Don't let that steer you away from good old Aunty! The cartoonish design has it's charm, and the site isn't bad at all, quite the opposite. You won't need much time to recognize Cozy Games site, and that is a good thing, specially since I think they are among the best out there. They have a serious Bingo offer, with 14 rooms and all the available Bingo variants: 75, 90, 80 and 30 ball games. You got it all, pre-buy, auto-daub, and a free £15 chip to start with, so really no excuses not to try. I usually play 30 ball games, and this time I managed to have a great run. Next thing I tried were the slots, and although it is a nice selection and all, I wasn't that lucky. Would recommend this site no matter what.